The Upside striped camo-print running shorts. 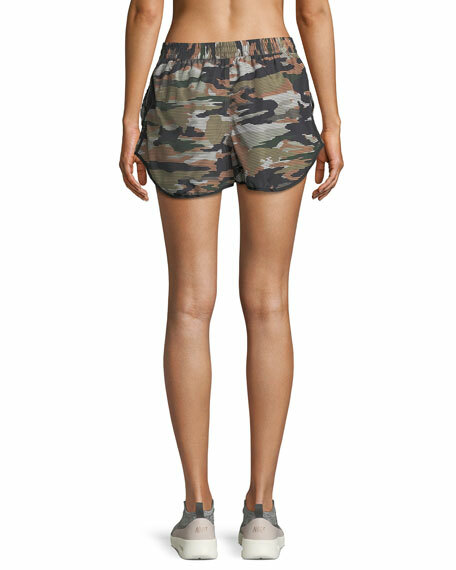 Alice + Olivia "Sherri" woven shorts. Embellished beading at sides. Mid-rise; flat front. Partial back zip. Slim fit. Lined. Polyester. Alice + Olivia "Sherri" woven shorts. Embellished beading at sides. Mid-rise; flat front. Partial back zip. Slim fit. Lined. Polyester. Combo, nylon. Imported. Model's measurements: Height 5'11"/180cm, bust 32"/81cm, waist 25"/64cm, hips 36.5"/92cm, dress size US 2/4. Johnny Was "Burken" linen shorts in camo with floral embroidery. Drawstring waist. Slash pockets. Relaxed legs. Linen. Imported. Please note: This merchandise may have a distressed effect. It is a unique feature that enhances the product and is not considered a defect. Johnny Was "Etienne" linen shorts featuring embroidered trim. High-rise; drawstring waist. Side slash pockets. Relaxed legs. Pull-on style. Linen. Machine wash. Imported. Please note: This merchandise may have a distressed effect. It is a unique feature that enhances the product and is not considered a defect. Josie Natori "Lillian" silk charmeuse shorts with intricate floral chantilly lace applique. Approx. measurements: 10.5" front rise; 1.25" inseam; 28"
Josie Natori "Lillian" silk charmeuse shorts with intricate floral chantilly lace applique. Approx. measurements: 10.5" front rise; 1.25" inseam; 28" leg opening. Elasticized waist. Vented front. Pull-on style. Silk; hand wash/dry clean. Imported. Model's measurements: Height 5'10"/177cm, bust 33"/84cm, waist 25.6"/65.2cm, hips 35.8"/91cm, dress size US 2-4/FR 34-36.